1200 Ala Moana Park Dr. Honolulu, Hawaii, Magic Island end of the park. 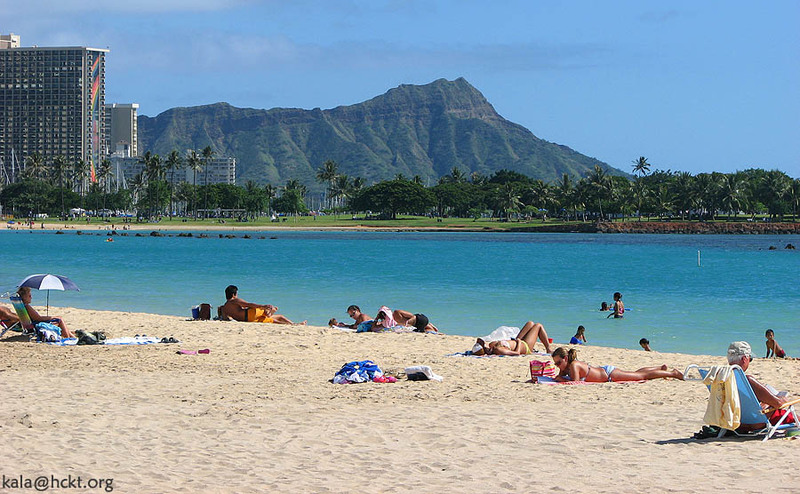 Ala Moana Beach Park is a big park. DIRECTIONS: Coming from Waikiki, come over bridge heading toward airport, just before passing Ala Moana Shopping center, take a left into the park, go around the bend, you will see outrigger canoes on the right, then just before red umbrella's for L& L Hawaiian food, take a left into the parking lot, we will pull up along the yellow poles behind the restrooms and showers, lifeguard stand E1 is diagionally to the left. Feel free to call when you arrive 562-206-3447. "Aloha Spirit” is the coordination of mind and heart within each person. Each person must think and emote good feelings to others. The Aloha spirit was an important lesson taught to the children of the past because it was about the world of which they were a part. One early teaching goes like this: Aloha is being a part of all, and all being a part of me. When there is pain - it is my pain. When there is joy - it is also mine. I respect all that is as part of the Creator and part of me. I will not willfully harm anyone.